Can fear explain the loathing that the victims of this ‘academic cleansing’ are exposed to, often by their own colleagues? Could insecurity justify the complicity? Many probably did, among them Yasemin Yılmaz and Orçun Selçuk, two PhD candidates from The City University of New York and Florida International University respectively, who saw this as an opportunity to share their work with and get feedback from their peers and senior academics in Turkey and beyond. Both received a positive reply from the organizing committee on 27 April 2017 and were invited to present their papers at the two-day workshop that was going to take place on 20-21 July at Koç University, Istanbul under the auspices of the Center for Research on Globalization, Peace, and Democratic Governance (GLODEM). “We are unable to offer any funding for travel and accommodation”, the generic invitation letter stated, but neither Yasemin nor Orçun cared as they were happy to be part of a scholarly event in one of Turkey’s most prestigious universities, in front of an audience that included scholars from other, equally prestigious, universities such as Sabancı, Bilkent and Özyeğin, to name but a few. The tentative programme of the workshop they were sent about a month later had their names on as presenters and asked them to submit their full papers on ‘Self-Coups and Presidential Power Grabs in Peru and Turkey’(Selçuk) and ‘Elite Interests and Media Suppression: The Cases of Turkey and Venezuela’ (Yılmaz) by 6 July. We hope this email finds you well. We are writing to you regarding the Turkey-Latin America workshop and we’re afraid it’s bad news. Last week, we, as the organizers of the workshop, were urged by the TPES Steering Committee not to include papers on politically very sensitive topics, given the potential consequences for everybody involved in the currently extreme conditions for academic work in Turkey. Unfortunately, your paper was identified as one such sensitive topic. Therefore, with the greatest regret and reluctance, we are extremely sorry to inform you that we have to remove your paper from the workshop. We are aware that you must have already made your travel arrangements and that presenting at the workshop might have allowed you to receive university reimbursement for your trip. We apologize for the great inconvenience this short-notice change causes for you. Right now, we can’t do much more than to ask for your understanding. If you would like to discuss this in more detail we can talk over skype or in person when you’re in Istanbul. Also, you would certainly be welcome to join us for the workshop informally, if you would still be interested in that. For the TPES Steering Committee it was just important that your paper does not appear on the official program or during the workshop. We look forward to hearing from you on this matter. Please let us know if you have any questions. “We look forward to hearing from you on this matter.” Nothing less, nothing more! How could the organizers, themselves well-known academics, (be willing to) write such an outrageous email? Who urged them to remove the said papers and to “disinvite” Yasemin and Orçun? We would find out, after the scandal became public, that most members of the TPES Steering Committee were not even aware of the decision, let alone the email (see below). Who decided that their papers were “politically very sensitive” and according to which criteria? Does “politically very sensitive” mean critical of the regime – a full-blown autocracy with Erdoğan at its helm? How could anyone with a modicum of collegiality, professionalism, in fact sense of decency, encourage two young scholars at the beginning of their careers to attend a workshop they have been disinvited from “informally”, adding insult to injury? 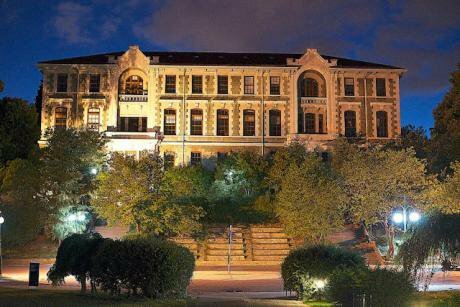 This incident is but the most recent, and perhaps also the most dramatic, example of the growing sense of fear and insecurity that has engulfed Turkish academia in the wake of the failed 15 July putsch. The details of the post-coup crackdown on institutions of higher education have been well-documented. To quickly recap, more than 5000 academics have been sacked with a string of executive decrees, including hundreds of Peace Declaration signatories, approximately 20 times more than the number of academics who lost their jobs in all the military coups combined according to some estimates. A lifetime ban from employment as civil servants has been imposed on most of the dismissed academic personnel; and their passports have been confiscated or cancelled. In the meantime, two scholars, Mehmet Fatih Traş and Mustafa Sadık Akdağ, have committed suicide; two others, Nuriye Gülmen and Semih Özakça have completed 130 days of the hunger strike they have commenced in an attempt to get their jobs back. Countless others who are lucky enough to keep their passports are desperately looking for a grant or job abroad, as reports released by such institutions as Scholars at Risk (SAR), Scholar Rescue Fund, Cara Scholars at Risk Network document. 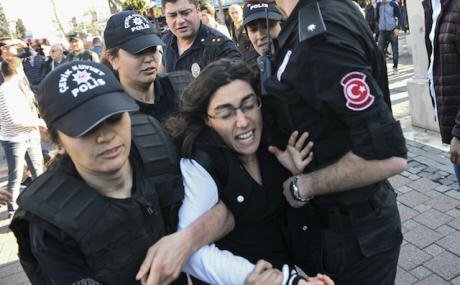 Turkish riot police detained demonstrators who gather at Besiktas to support detained teachers Semih Ozakca and Nuriye Gulmen, in Istanbul, Turkey, on May 23, 2017. Depo Photos/Press Association. All rights reserved.Under such circumstances, fear is warranted, and a certain amount of caution is not only necessary but also advisable, in particular for those who have families or loved ones to care and provide for. It is not fair to ask those who do not have the means or the will to leave the country to be “heroes”, given the indifference of the not-so-silent millions who have expressed their approval of Erdoğan’s ambitions in the 16 April constitutional referendum or western leaders who, while on occasion expressing their concerns, do not hesitate to happily shake hands with Turkey’s strongman when a photo op presents itself. But can fear explain the loathing that the victims of this ‘academic cleansing’ are exposed to, often by their own colleagues who are trying to cozy up to the regime in order to share its spoils? Could insecurity justify the complicity of hoards of administrators – among them rectors, deans, directors of centers and think tanks – who provide lists of “traitors” to be wiped out; or of the power-hungry lower-ranking “academic” who snitches on his/her colleagues to get a promotion? Last but certainly not least, will we satisfy an authoritarian regime bent on eliminating all signs of dissent, within academia or anywhere else, by pursuing a policy of “appeasement”? The answer to the last question raised above is “yes” for some – certainly, it seems, for the organizers of the 5th TPES Interdisciplinary Workshop and/or those who “urged them” to remove the allegedly politically sensitive papers. There are, however, those who disagree and call for a “targeted academic boycott” of the Turkish higher education system. They define themselves as a group of academics united in their commitment to academic freedom and international standards stated in various international documents on higher education, including some signatories of the Peace Declaration. As is the case with, say, the BDS movement, not everybody is a friend of this call, or boycotting in general. It is argued for instance that the call should come from “inside”, i.e. those affected; that a boycott would cause more harm than good to those who chose or had to remain, hence for whom interaction with the outside world is vital (that a boycott of the Turkish Higher Education Council would amount to an end to all EU and Erasmus projects); and that the boycott would risk destroying existing niches rather than building up alternative ones. And so on. Even though I am broadly sympathetic to the logic (and the feeling) behind this thinking, I do not think the counter-arguments hold much water, at least not in the case of this particular call. For one thing, the lines that separate the “inside” from the “outside” are hardly clear. Most of those who have issued the call are recent, involuntary, victims of the purges themselves and do not particularly enjoy being in exile. In any case, it is not realistic to expect such bold actions from those “inside”, as the consequences would far outweigh any benefits that could be derived from these actions. Finally, those “inside” themselves turn to their colleagues “outside” for solidarity since the latter can help them in a variety of ways, by raising awareness, by mobilizing international public opinion, or simply by acting as a “ventriloque” for those whose voices are muffled. On the other hand, this call for academic boycott is “selective”, targeting the Higher Education Council (YÖK) and the Scientific and Technological Council of Turkey (TÜBİTAK) which have been the perpetrators of the regime’s oppressive policies and “complicit universities” which have not only dutifully implemented the orders given by the government, but also encouraged the remaining staff to act as “informants”. The targeted boycott call explicitly excludes “(a) arrangements/agreements designed to help/facilitate student exchange and (b) requests from individual academics in Turkey for visiting fellowships or similar engagements with universities outside Turkey”. As for existing niches, again, the boycott does not target institutions of higher education who nurture such niches; in any case, as the Koç-TPES controversy clearly shows, the number of such niches is shrinking by the day (the government has rounded up 72 more academics even as this essay was being written, among them academics from the hitherto “untouched” Boğaziçi University). I believe it is high time not only to boycott government-controlled institutions of higher education and complicit universities, but also to extend the boycott to those who are tempted by Neville Chamberlain’s dreams and pursue a policy of appeasement vis-à-vis Turkey’s rogue government, i.e. private universities such as Koç and associated centers such as GLODEM and TPES – among others – which masquerade as respectable institutions of higher education dedicated to “critical thinking, collaborative research and networking” while taking a pro-regime stance on “politically very sensitive” matters. Those who took the decision to “disinvite” Yasemin Yılmaz and Orçun Selçuk and send them the above-quoted dreadful email may continue to believe, as Chamberlain did, that “they are bringing peace with honour”, then “go home and get a nice quiet sleep”. But as the “great appeaser”, in R. A. C. Parker’s words, himself realized when the Second World War started in September 1939, they may find out that everything they have worked for, everything they have hoped for has crashed into ruins. And they will be, in fact we will all be, remembered by the choices we have made in these straitened times. Morality does not stop at the frontier’s edge. These principles are universal . . . It may, as a pragmatic matter, be that you can influence your own side more. But I also know from working in the Middle East for decades now that if you’re in jail in Saudi Arabia or Iran, and you feel you’re forgotten, it means a lot to know that there are people in the West who are publicizing your case, who are protesting or sending letters, which never get answered . . . It makes a difference. I would like to thank Yasemin Yılmaz and Orçun Selçuk for sharing their story with me. The responsibility for the views expressed herein lies solely with me. I have contacted all members of TPES Steering Committee and GLODEM – most of whom I know personally – on 28 June 2017 via email and asked for some clarification. Out of thirteen people, only two have replied and they have both refused to make further comments. See for example the special issue of Globalizations I have edited (open access), in particular Özkırımlı 2017 and Kandiyoti and Emanet 2017. See also Baser et al. 2017 and Abbas and Zalta 2017. See Özkırımlı 2017 for the story of Mehmet Fatih Traş. For the purposes of full disclosure, I would like to state that I am not part of the group which organized the boycott and have become aware of it after it has been announced publicly, like everyone else. I am, however, one of the signatories of the petition that supports it. R. A. C. Parker, Chamberlain and Appeasement: British Foreign Policy and the Coming of the Second World War. Palgrave Macmillan: London and New York, 1993, p. 1.